Some contradictions preserved for the record. Emin on receiving funding from DARPA (link to tweet). 2. One version of the Selfish Mining paper which still mentions DARPA support. 3. Emin on the Selfish Mining paper and topography (link to tweet). 4. The Selfish Mining paper making specific assumptions about topography. 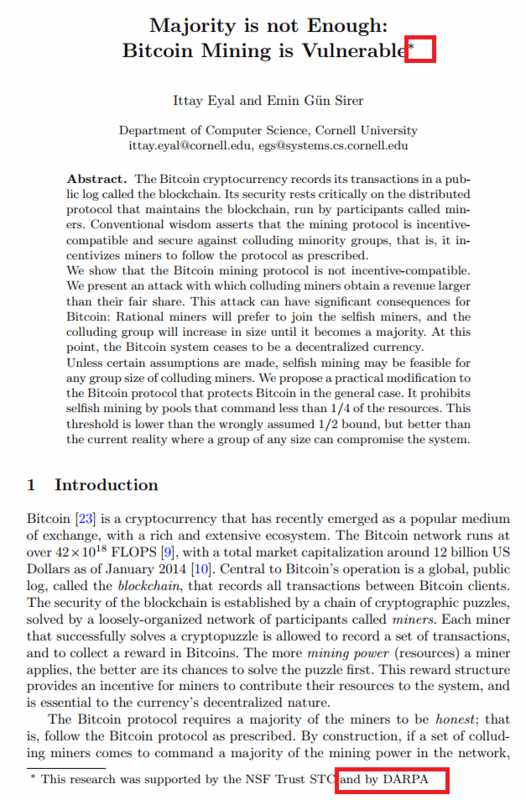 Many statements throughout the Selfish Mining paper are framed around the assumption that miners are randomly placed in a peer-to-peer network among non-mining nodes, rather than intentionally connected via whitelists. This SM debate has become quite heated, which is curious as there seem to be few that think it is an actual problem in practice. It doesn't help that the SM problem is described with a level of math not everyone can understand and verify. I do think Bitcoin Cash detractors are using this discussion as an opportunity to sew the seeds of doubt and generally disrupt the community. Regardless, the name-calling and outrageous accusations, from Bitcoin Cash supporters I respect, really does detract from their message. Please @VRT, point out any name-calling or outrageous accusations in the post above if you see it. Your message is without direct context to this post, whether lauding it's lack of commentary about Emin beyond the contradictions (an intentional choice), or lamenting that there was name-calling or outrageous accusations (which there are none, there's just dodgy looking contradictions). I conclude that it is a lamentation on the childish tweets and outbursts elsewhere by actual prominent community members (which I am not). If so, I agree wholeheartedly. To them, I say.. shame, shame, shame. @Gussie Finknottle, to confirm, my comment was not directed at you. Thank you for your article!